This story first appeared in the June issue of Ebony magazine. This layout is awesome. H/T to Pedro Vega Jr. for creative directing this shoot. All images are copyrighted and are by Aaron Smith out of LA. Behind-the-scenes images are by Geoffrey Black. CHANCELOR BENNETT IS NOT one of those stiflingly religious types who answers every question by saying he is “blessed” or starts every sentence with a “hallelujah.” Yet the presence of God is stamped all through his Grammy-winning album, Coloring Book, and his positive spiritual vibration is palpable the moment he hits the stage. The 24-year-old MC is happy he learned to listen to that still, small voice. As a young Black man in the entertainment biz, he could have lost his mind after relocating to Los Angeles to further his career, but the Chi-Town native returned home, where he felt a connection to the divine. All images are copyrighted and are by Aaron Smith out of LA. and behind the scenes images are by Geoffrey Black. Discernment, eh? That word seems to describe exactly how Chance the Rapper has gone as far as he has. Despite his deep faith, he’s not a gospel rapper trying to turn mainstream and failing. He’s not even a mainstream rapper looking cheesy by shoehorning a deity into the lyrics. Hell, he won’t even sell his soul, ehem, sign a contract with a record label. 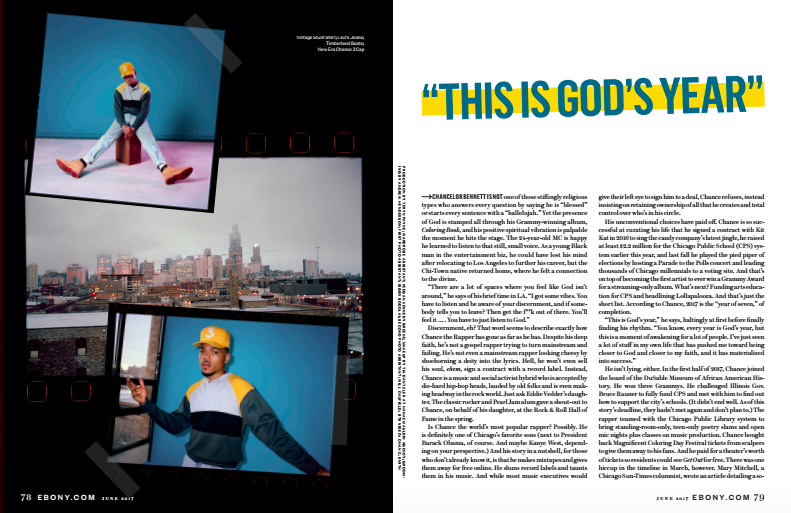 Instead, Chance is a music and social activist hybrid who is accepted by die-hard hip-hop heads, lauded by old folks and is even making headway in the rock world. Just ask Eddie Vedder’s daughter. The classic rocker and Pearl Jam alum gave a shout-out to Chance, on behalf of his daughter, at the Rock & Roll Hall of Fame in the spring. Is Chance the world’s most popular rapper? Possibly. He is definitely one of Chicago’s favorite sons (next to President Barack Obama, of course. And maybe Kanye West, depending on your perspective.) And his story in a nutshell, for those who don’t already know it, is that he makes mixtapes and gives them away for free online. He shuns record labels and taunts them in his music. And while most music executives would give their left eye to sign him to a deal, Chance refuses, instead insisting on retaining ownership of all that he creates and total control over who’s in his circle. All images are copyrighted and are by Aaron Smith out of LA. His unconventional choices have paid off. 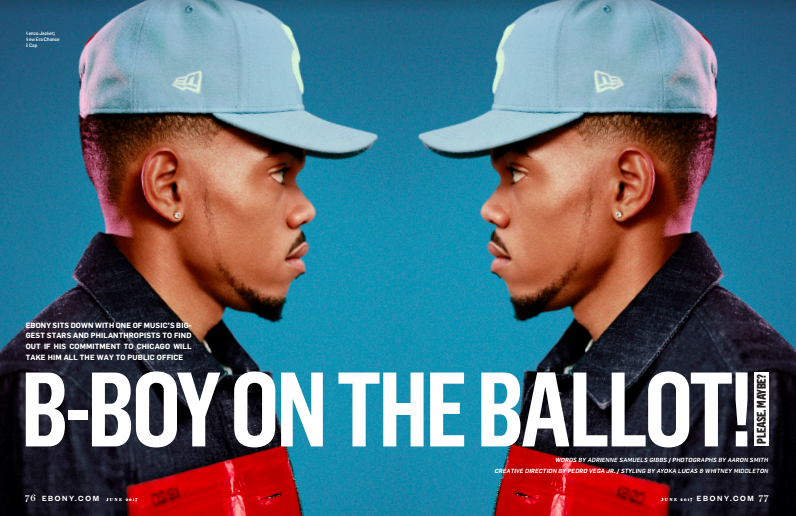 Chance is so successful at curating his life that he signed a contract with Kit Kat in 2016 to sing the candy company’s latest jingle, he raised at least $2.2 million for the Chicago Public School (CPS) system earlier this year, and last fall he played the pied piper of elections by hosting a Parade to the Polls concert and leading thousands of Chicago millennials to a voting site. And that’s on top of becoming the first artist to ever win a Grammy Award for a streaming-only album. What’s next? Funding arts education for CPS and headlining Lollapalooza. And that’s just the short list. According to Chance, 2017 is the “year of seven,” of completion. He isn’t lying, either. 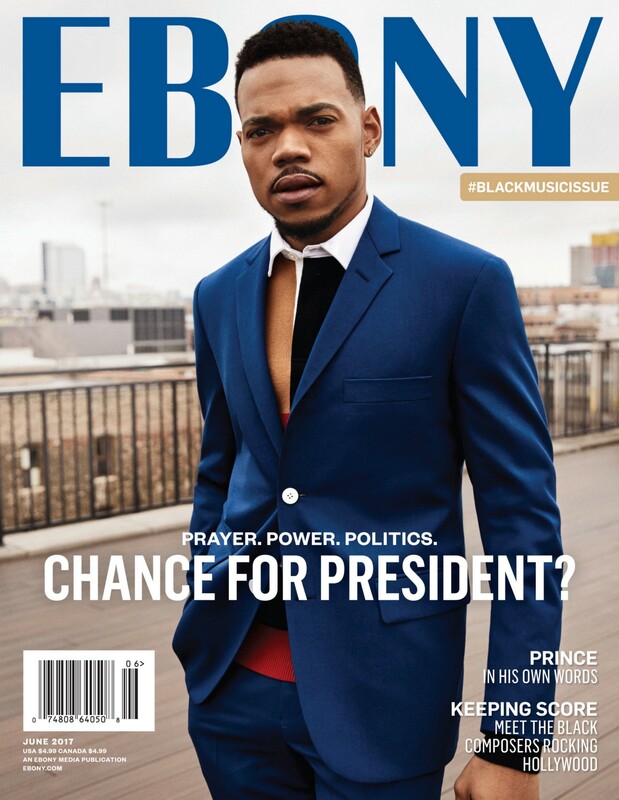 In the first half of 2017, Chance joined the board of the DuSable Museum of African American History. He won three Grammys. He challenged Illinois Gov. Bruce Rauner to fully fund CPS and met with him to find out how to support the city’s schools. (It didn’t end well. As of this story’s deadline, they hadn’t met again and don’t plan to.) The rapper teamed with the Chicago Public Library system to bring standing-room-only, teen-only poetry slams and open mic nights plus classes on music production. Chance bought back Magnificent Coloring Day Festival tickets from scalpers to give them away to his fans. And he paid for a theater’s worth of tickets so residents could see Get Out for free. There was one hiccup in the timeline in March, however. Mary Mitchell, a Chicago Sun-Times columnist, wrote an article detailing a so-called “child-support spat” with his former partner, Kirsten Corley. Chance didn’t think the timing of Mitchell’s piece was pure happenstance. Chance’s dad, Ken Bennett, is a longtime political operative who once worked as an Obama aide and also as a deputy chief of staff for Chicago Mayor Rahm Emanuel. Now, as his son seems to put Chicago on his back everywhere he goes, theelder Bennett works for the tourist board. Chance’s younger brother, Taylor, is an artist in his own right. Like Chance, Taylor was touring this year, and will play a few summer festivals. His mother, Lisa Bennett, started out as a hairdresser and through her shop was one of the first people to welcome the city’s storied Egyptian hairstylists to the area. Chance’s parents met in her salon, actually. Ken Bennett came in to get a haircut, and the rest is history. 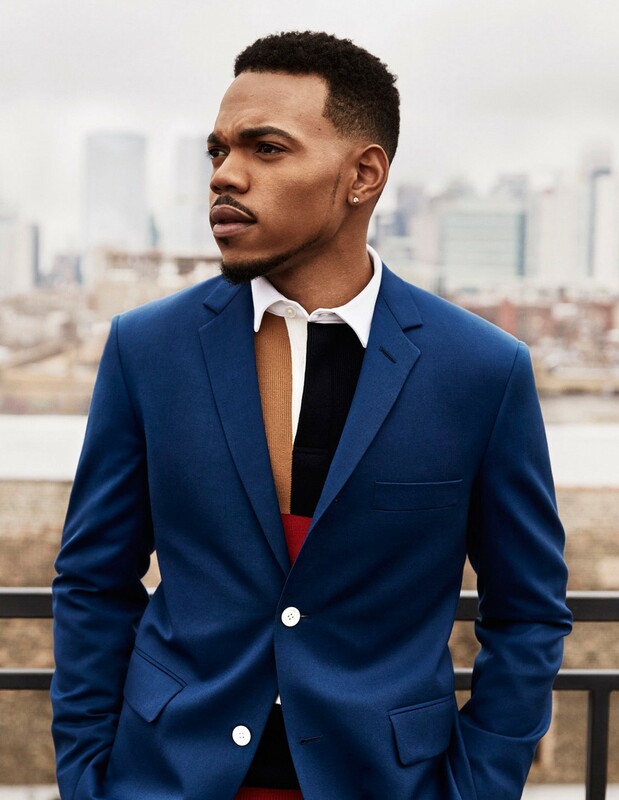 Chicagoans take their celebrity sons seriously, and Chance is a hallowed person right now, especially after donating such a large amount to public education. He represents the South Side of Chicago in ways that balance out the narrative of a city that is often unfairly portrayed as overridden with Black thugs who are overpoliced by White cops. Even if you aren’t a fan of his music, if you live in the city, you’ve heard of Chance or seen him work or are Facebook friends with someone who benefitted from his generosity. 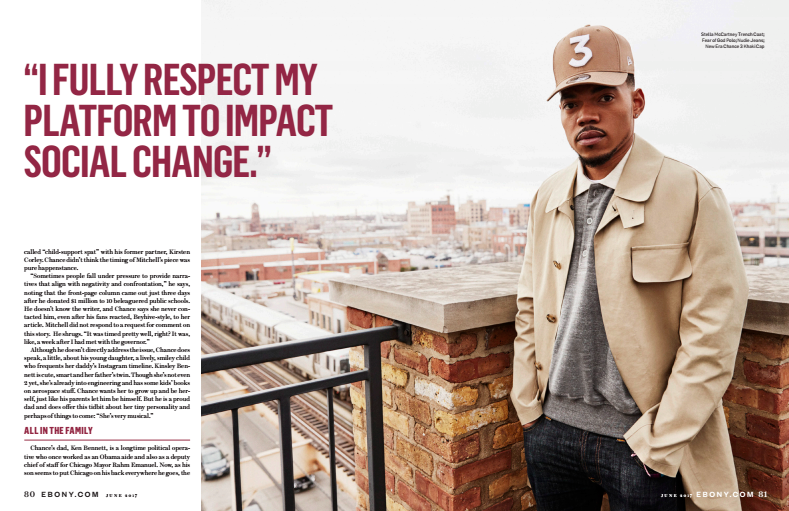 Chance and his manager/friend Pat Corcoran worked on the deal that led to AEG, LiveNation and other independent tour promoters to donate the proceeds of their processing fees to SocialWorks, the charity through which Chance donated the cash to CPS. The initial $1 million donation, spread among 10 schools, including Westcott, led the Chicago Bulls and Windy City native comedian Hannibal Buress to pony up some dough as well. But is saving Chicago too big of a goal for the rapper? Maybe. Maybe not. Byron Cage, whom Chance called up last year and requested to sample a part of the Grammy nominee’s 2005 song “Holy Holy Holy,” agrees with Brantley’s assessment that the rapper is something special. Cage brings up a Bible verse, Samuel 16: 14–23. It’s essentially about how David played his harp and in so doing, helped King Saul find mental relief from torment. No pressure, but Chance is kinda like that, Cage notes. His music soothes. His tweets mobilize. And what would happen if people wrote him in? Would Chance serve his beloved city, even if he didn’t run? He chuckles before cracking a smile. “I would never run for any office or government position,” he says, plainly. ADRIENNE SAMUELS GIBBS IS A CHICAGO-BASED WRITER.